Some of you might have seen the tinyworld example originally made available for HANA XSA. As you also might know HANA XSA is pretty similar to the CloudFoundry standard except it is running “on premise” so to say. For efficiency reasons I am writing this blog to get you through the example with less hurdles than I had. This may be obsolete in the future or incomplete, as cloud development brings a new challenge we never had the pleasure to live with: updates can really annoy you, as they come faster then ever before. This means also that menus and functionality may change faster than we have been used to it. As a result manuals and blogs cannot keep up with that speed. So this blog also becomes an experiment how to handle cloud dev speed in the future. First let me point to some reference of documentation. As said before the base for this will be the HANA manuals with Create a Simple “Tiny-World” Application. To prove my point you also might want to check out the blog series of my colleague Chaim Bendelac Developing with XS Advanced: A TinyWorld Tutorial written in 2016. You will find that this tutorial still is somewhat accurate, but webIDE has changed since. The big advantage is that is has – unlike the manuals – pictures in it. And there are still some deeper explanations (like in chapter 7, “Under the Hood) that explain some details worth knowing. Start the SAP Web IDE for SAP HANA. Obviously as we want to use CloudFoundry your WebIDE is the “SAP Web IDE Full-Stack” which does not yet run from CloudFoundry, but from the NEO stack. It is OK to actually start it from your trial account. If you own already a commercial account you have access to this WebIDE. The only difference between trial and commercial account is that a GiT connection is not working. But this is not part of the tutorial anyways. When referring to the rest of the file you will find that this is just a change in name and everything sorts out in the rest of definitions. I will not further refer to such logical changes. Also please be adviced that CloudFoundry URLs are much more complex than the ones mentioned in the HANA manuals. This should not disturb you and the rest of the first part of the tutorial should work like a charm. 8. Create an HTML5 module for the client user interface. Chose ViewType: None and click finish. Copy the code from the tutorial step 8.c. Go to tinyui/webapp and open index.html. Replace all the code with what you just copied. 9. Set up the details of the calculation view. 10. 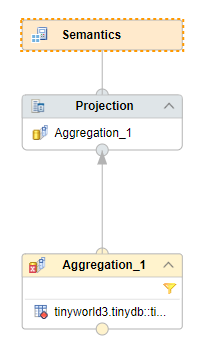 Create an OData service to display exposed parts of your data model. there is one warning from my side: DO NOT COPY MTA CODE FROM THE MANUALS. The full name of a database object can be seen in the database explorer when clicking for example on the database tables in the lower left window. ran really well for me. There is more interesting stuff and I will continue to check this. Stay tuned for more “slightly changed tutorials”. Link will be added here as soon as more is available. Thank you for your experiences for deploying the application on CF. I tried the same and worked for most part. I am facing an issue though with seeing the data in UI. When i assess the Node.js service “/euro.xsodata/euro?$format=json”, i am able to access the data. i made the changes to xs-app.json and mta as mentioned in the tutorial. Could you please let me know if i am missing any step for UI integration?